LG G watch is LG’s entry into the futuristic Android Wear world. It works with any Android device running 4.3 or higher, which means you don’t have to own a LG device. Displaying the appointments or notifications on google’s cards with just a swipe of the watch face will give lot of convenience to the user. LG’s G watch has 24 different watch faces. You can say “ok Google” to launch an intuitive search on the G watch. One of the major advantages of smart watches like the G watch is that you can push all the notifications that reach your phone to your watch. You can easily check the weather or any upcoming event at a simple flick of your hand. Keep in touch with your friends and officemates through chats and emails . All this is done without even touching your device. Voice commands do most of the jobs, making life easier from you. The G watch is one of the most popular and affordable smart watches in the market today. However the watch apps market is only in the initial phase at this moment. We can cater to this market by building apps using the Android Wear’s sdk. Quintet Solutions offers offshore developers for G Watch to develop applications running on G Watch, extending functions of apps already present on Android devices to the G Watch and also develop watch faces as needed for your watch form factor, with the help of our highly expert designers. Watches are fashion statements and when we add the extra X factor, it becomes even more enchanting. LG’s G watch is an Android version broken down to suit needs of a wearable device. LG’s G watch organizes your information, and shows it to you, before you even ask for. Get messages from your friends, appointment notifications, and weather updates at a just a glance. You’ll get notifications from all your existing Android apps on your LG’s G watch. LG’s G watch connects your phone to your wrist. 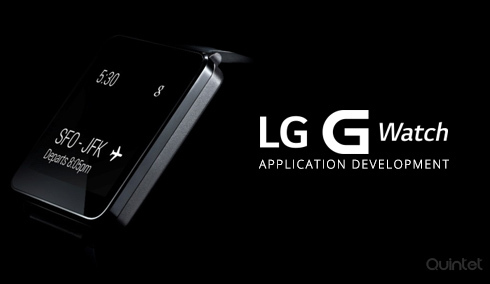 At Quintet Solutions we understand this purpose and we can make your apps ready for LG’s G watch. LG’s G watch main area is Health and Fitness. Quintet’s Android Wear Developers will be able to use this information available from the LG’s G watch and develop innovative apps. Our Android Wear developers are developing G watch apps using Android Wear SDK. Designing watch faces and other Screens are what our designers take as a challenge. Designing apps for wearable devices powered by Android Wear is pretty much different than designing for phones or tablets. With in depth research and experience our developers possess vast knowledge which is applied in the apps they create. Our designers keep themselves updated about different UI elements of the watch and about the options that can be made available for users to interact with their smart watch. Smart Wearables if future’s big market, and Android Wear will certainly have its relevant place in it. Our team of Android Wear Developers and Designers are already working with Android Apps that will be able to sync notifications to your G Watch. Android Wear also supports your Voice commands which is the main essence of using the smart watch. Quintet provides you dedicated 24/7/365 support services for clients. Our Customer support techs are well versed with all the popular ticketing or Live chat systems in the market. We also have unparalleled infrastructure with enough power backup and robust high speed multiple internet connections.